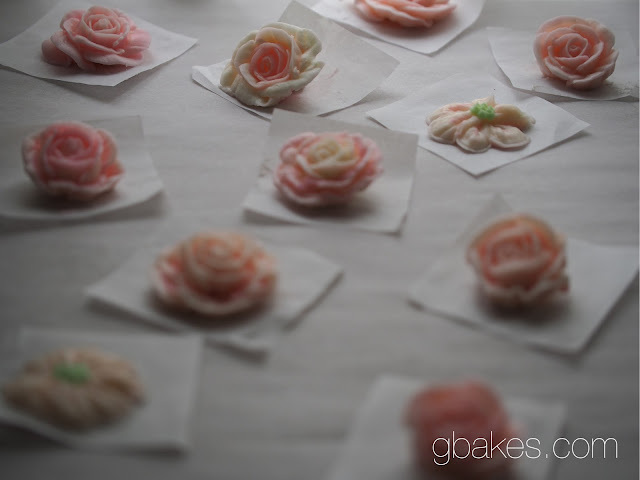 I've been piping buttercream roses for the past week. Yes, I had a project but now I can't stop. I won't stop. 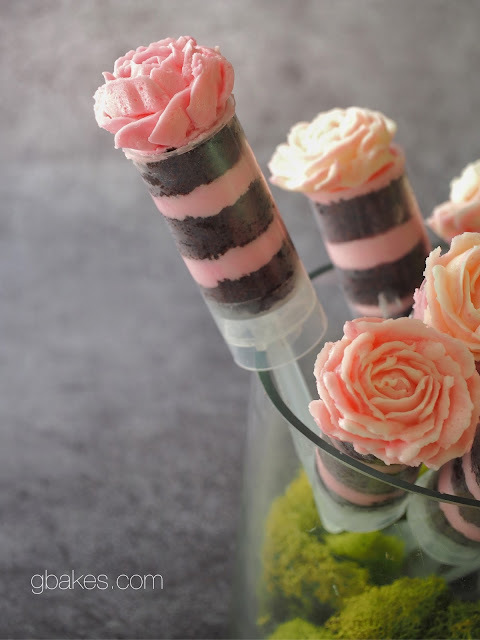 It's akin to the addictive nature of knitting, when the process hijacks your hands and the next thing you know you've got a kitchen full of scarf (or a field of buttercream roses). "A post! I'll write a post! And Ray can shoot a Cake Magic video! 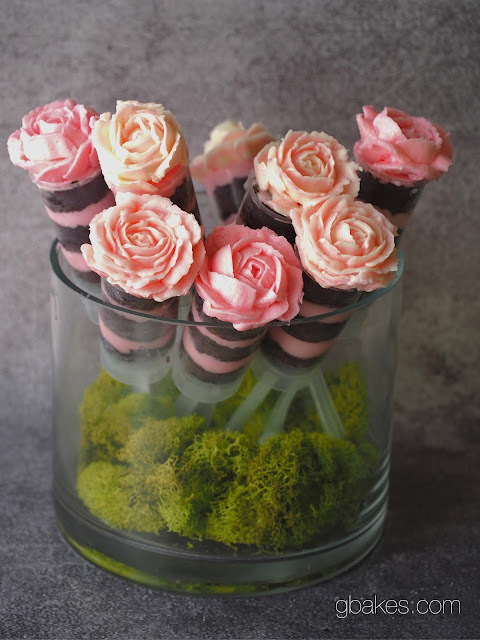 That's how I'll put these roses to use!" 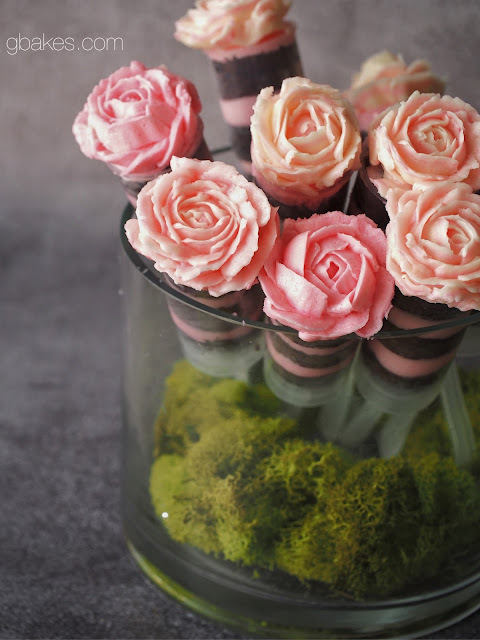 After further thought, I realized perhaps simply piping a rose wasn't all that much fun unless there's cake invited to the piping party. 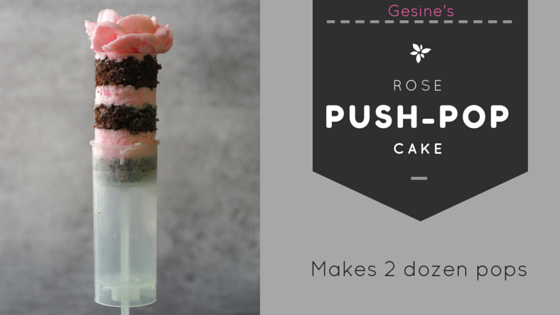 I came up with the rose push-pop cake because who doesn't love a push-pop filled with cake...topped with a rose? Even better, you can work in any combination of flavors you like. Not a fan of buttercream? Use curd as a filling. It's a push-pop, it'll stay put If you need push-pop containers, and who doesn't, you can get them at Amazon. For the video demo, go HERE. Preheat oven to 350ºF. Line a half sheet pan with parchment and spray with non-stick cooking spray. Set aside. In a large bowl, sift the flour, sugar, cocoa, baking soda and salt. After sifting, whisk the ingredients together for 30 seconds to distribute the leavening. Make 3 small wells in the dry ingredients. Add the vanilla in one, the vinegar in another, and the oil in the third. Pour the coffee and water over it all and immediately whisk the batter until well combined. Immediately pour into the prepared pan, tipping it back and forth to level the batter, and get that puppy in the oven. Bake for 25-30 minutes or until the cake springs back when gently poked. Allow to cool completely before moving onto your cake popping. In a heavy saucepan, combine the sugar, water and lemon juice. Stir over low heat until the sugar has melted. If there are sugar crystals on the side of the pan, use a damp pastry brush to encourage the crystals to join their melted friends. Attach a sugar thermometer, raise the heat to medium and cook the sugar mixture to 250ºF. As you get to temperature, put your egg whites in the SPARKLING CLEAN bowl of a stand mixer fitted with the SUPER CLEAN whisk attachment. Start the mixer running and add the salt. Allow the egg whites to get nice and foamy and carefully pour the hot sugar mixture into the bowl with the mixer running. Aim just above the whisking whites but make sure not to hit the moving whisk otherwise hot sugar will go flying. Continue whisking on high until the bowl is cool to the touch and the meringue has stiff peaks. Add the butter a tablespoon at a time. At first the meringue will deflate. It might look like it's starting to separate or curdle. Once it does that, throw in another knob of butter and walk away. The buttercream will thicken and smooth out. Add the extract and dye and mix until combined. For assembly, watch the video!